On the Road..... and Then...? : Frazzled but delighted! A bit of a gap from my Raleigh post in May. In my defense, I have been too sweaty, wet from rain, tired and in a lot of bone deep pain to make much sense in print. Ever since we got to Raleigh I have been fixing and tweaking items and issues on our rig. Time does take a toll and my list of work and changes had gotten quite long. Worse, most of these items were outside. Things like fixing roof issues including putting Eternabond tape on the end cap seams and skylight, take a lot of outside physical effort and time. In the Raleigh summer climate this might as well be in Haiti. One is going to be perpetually soaked from the effort of just thinking but adding actual physical activity turns one quickly into mushroom fodder. Most of the major items did get done in Raleigh but summer time was leaking away and we were already very late getting there from Florida. Our plans included a visit to Champaign, IL to see our youngest son, Randy, and wife, Shawna. From there we would go on west to the Rocky Mountains, Glacier National Park and other parts of the Pacific Northwest before settling in Port Orford, OR for the coming winter…. That was the plan. We are still in the plan but somewhat skewed in time as we have just arrived in Champaign, IL. Between Raleigh and here was a stop to see daughter Carol Ann near Charlotte, NC. Her recent job change now has her living and working in that area and she is still in the settling-in process so we really wanted to be a part of this event in her life. We took her out for lobster on her birthday and it was really great to see her so happy and adjusting so well to a totally new environment, life circumstance and job. I can now move on and not feel that I am leaving something unfinished or unsupported. She is productively engaged in being her own person and she and Samantha have some excellent times coming. We stayed in the Cross Country Campground in Denver, NC while visiting them. It is on the north end of Lake Norman, west of Mooresville, NC and although it is listed as Denver, NC it is actually in Sherrill's Ford, NC. I mention this because the Butcher Boy Buffet is an excellent place to get a nice all you can eat meal for a reasonable price and it is right across the street from the campground. The campground was ok but not great. The weekly pull through sites are near the highway (NC 150) and while it is not terribly busy there are a lot of motorcycles and loud cars on it. After all, this is NASCAR racing country. Our move from there to Champaign took us through Raccoon Valley Escapees RV Park in Heiskell, TN for 1 night (that was enough) and then on to Mammoth Caves area of Kentucky. 20 miles out of Raccoon Valley I blew a tire on the trailer. It was shredded completely! Fortunately, nothing was really damaged but the Tennessee mountains are not great cell phone areas so it took a few hours on a Sunday morning to get Good Sam’s Emergency Road Service guys to me and swap in my spare. Yesterday, I just got the blown tire replaced but still have to remount it on the trailer before we leave. Our trip was planned to next go to Campbellsville, KY to checkout the Amazon fulfillment center and campground for a day then on to Mammoth Caves but I tore something in my calf muscle wrestling with the blowout situation and was just not up for walking. We just skipped Amazon and landed in the Singing Hills Campground in Cave City, KY for a night before moving on to Champaign. The Air Conditioner in the Truck is on the fritz and though I had put some Freon into it before leaving Raleigh, we have not had it working to this point. A good note here is that the weather has been very, very non-typical for the southeast and with the exception of a couple of hours on the way to Cave City the drive has been very pleasant with the windows open. I don’t expect this good weather fortune to last so I really do have to get that A/C fixed before we leave here. 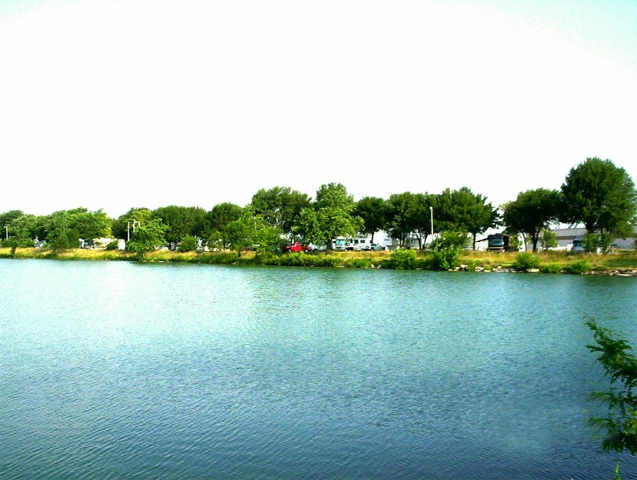 We are now in the D&W Lake Campground and RV park in Champaign, IL and it is wonderful! A little pricy but worth it for its location to both our kids and our suppliers of food and materials (restaurants, Home Depot, Aldi, etc). The sites are quite level, gravel and the grass is well maintained. It’s on a great little stocked lake, too. Just hard to imagine all this in the middle of Illinois. The owner’s live onsite and are really great, too. They bent over backwards to accommodate our unexpected arrival to stay for a month. This is pretty much the view we have from our site.We will be here for a few more weeks as I finish up the gotta-do’s before heading on westward to the Rockys. I have a few slideout issues that I may stop by the factory repair center in Grand Island, NE to get fixed… if it’s not too expensive. Beyond that, I’ll let you know.